We might have just missed the end of the world, but the end of 2012 is definitely nigh and this means it is time to take a look back and see what changed in mobile throughout the year. If we had to put it shortly, we’d say - everything. Nokia, from the world’s biggest phone maker tumbled catastrophically and when it comes to smartphones it is in dire straits. Samsung has cannibalized a huge part of its market share, and is now the biggest manufacturer when it comes to both feature and smartphones. Apple has continued rising steadily, cementing its position as the second biggest phone maker after Samsung and second biggest platform after Android. The rise of Chinese companies only continued, and now Huawei is expected to take a confident third place in the ranking of biggest smartphone makers for the year. Race for 4th is between Sony, ZTE, Nokia and RIM. Interestingly enough, Motorola is no longer in the top 10 of smartphone makers, and it is possible that Nokia as well drops out soon, chased by little known Coolpad from China. But let’s wait and see how those Holiday sales were before jumping into conclusions - and don’t forget, those are all preliminary estimates. I won't be wrong to say Nokia has learned a l'le lesson. And since they have taken WP as their primary OS, i hope they improve the ecosystem and continue building up. And i do hope 2013 has less patent game-play. Tired of reading about it. Yes Wendy, they won't die...for an OEM to die it would take something tragic. Duh!! Who in the world are these people painting this page red. Thumb us down we don't care, but atleast see if the comment is reasonable or not!! Sheeshhh!! after the launch of blackberry 10 OS with 60000 apps,RIM will retains its 3rd position in next year and WP will move to 4th position outsolding Bada & Symbain in 2013. Well, what have we learned from this article? Let's see: 1. Android #1 OS! 2. Samsung #1 Manufacturer! 3. Apple / iOS holding on to #2 manufacturer and OS, respectively, by default cuz' everything left is just abominable!! 4. Nokia made the wrong decision in partnering with Microsoft (like we all predicted it had), hence, Titanic sank for a second time: R.I.P. Nokia. 5. Microsoft Windows Mobile still mismanaged six years after the Windows Mobile 2005 disaster. 6. BlackBerry: oh well, not even worth typing characters in this post for it. If you had just typed "6. R.I.P BlackBerry" you would have typed far fewer characters than you did. lol... +1 But I did that for Nokia, kinda' was redundant to even say it for BlackBurried. Passed up by Bada and a killed off Symbian, wow. Come on now. Haven't you been here longer then 2 months? WP7 never sold well. It was trending upwards, but had never been higher then 2%-3% depending on which analyst was providing numbers. Bada and Symbian have ALWAYS outsold them. This is not news. Throw in WP 7 device not selling a lock over the summer due to WP 8 anticipation and that no device was getting upgraded. The only real question is what WP8 sales look like in December. First year of Metro: wait till the Nokia phones come out! Translation: first released phones weren't that great. This year: ........ no excuses, both Nokia and HTC have some great WP phones. Of course I've been following this since the beginning. Since the new WP format, they've thrown good phones at it, polished marketing, sales, and just about everything else and it's still stagnant. So yeah, wow. Biggest saving grace for WP is if W8 takes off. First reports indicate that isn't happening, people just aren't into the new tile format like MS thinks they would/should be. And before all the W8 lovers spam this with thumbs down, for the record I would love to see Nokia come back with a vengeance. I have a ton of respect for Nokia, they build great phones. Not sure if WP was the best decision for them to make though. Yeah, stop kidding. Huawei No.3 manufacturer! Bada is still larger than wp! Dude you forgot sony and htc and wp. Nokia should return to its paper manufacturing unit,,,,,, microsoft y not SONY for ur expansion.............!!!!!!! If i'm not wrong, Sony has to make the first move, not Microsoft! 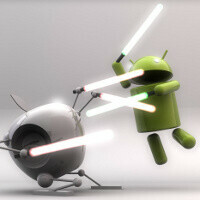 Is that why android is losing market share in the US. Read the latest report from Kantar; It really doesn't look good for google or the fanboys like yourself. So did everyone else except the most rabid of fanboys. According to Kantar, there is a growing trend away from Android. The platform even lost 20% of its US market share over the last 12 months, which is a very worrying sign for google. Of course this isn't the sort of news you'll see on phone arena. Because it's not true, they haven't lost 20% share. They might have slipped a few %, but not 20%. Sorry Edmund, but I would need some links to believe that. If Android has lost ANY percentage in sales, it may be due to new smart phone buyers selecting iPhones or maybe some other OS. The actually number of Android devices is higher then ever according to every sales chart I have seen.